1. 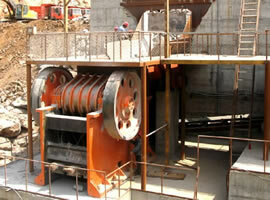 Before starting, the gravel crusher and power unit should be installed firmly. 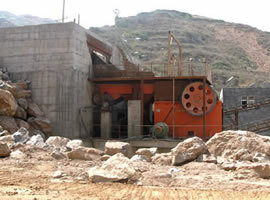 If the user needs a long-term fixed operation, we can fix the gravel crusher on the cement foundation; If for a mobile operation, the units should be installed on a specially-made base, and the belt pulley of the power machine and sand making machine should be ensured in the same rotary plane. 2. After the installation, inspect the fastening situation of each component and the tightness of the belt. 3. Before starting up, check if the hock, rotor and hammer can operate flexibly and reliably, if there are collisions in the shell, and if the rotation direction of the rotor is correct. 4. Avoid by all means replacing the pulley parts, in case that the high rotating speed cause an explosion to the crushing chamber, or that the speed is too low and directly affect equipment's work efficiency. 1. After starting, the gravel crusher should be kept running unloaded for 2 to 3 minutes. If no abnormalities, it is time to input materials. 2. Pay attention to equipment's operation situation at any time and keep an even feeding. If there still exist other problems such as abnormal vibration, noise, bearing overheating and so on, we should immediately stop to check. 3. In general, the no-load idling should be kept for four hours. The feeding size should conform to the specification and water content shouldn't lower than 10%.